The diagnosis of systemic lupus erythematosus (SLE) depends on clinical evidence of renal, rheumatologic, cutaneous, and neurologic involvement, supported by serological markers. A previously healthy 14-year-old girl presented with Libman-Sacks endocarditis involving the aortic valve as the first manifestation of SLE. Even though she did not satisfy the American College of Rheumatology criteria for diagnosing SLE, she had anemia, proteinuria, elevated erythrocyte sedimentation rate, low complement 4 (C4) levels, and strongly positive antinuclear antibody titer. A renal biopsy showed stage IV lupus nephritis. Treatment was initiated with immunosuppressants and steroids. This type of presentation may be misdiagnosed as infective endocarditis missing the underlying collagen vascular disease. Libman-Sacks endocarditis (synonyms: Verrucous, marantic, or nonbacterial thrombotic endocarditis) is the most characteristic cardiac manifestation of systemic lupus erythematosus (SLE). We report a case of occult SLE with active lupus nephritis in which Libman-Sacks endocarditis was the first presentation. A previously healthy 14-year-old girl was found to have a heart murmur when examined during an episode of upper respiratory tract infection. There was no history of rashes, weight loss, prolonged fever, abdominal pain, joint pains, hematuria, or convulsions. She was afebrile at the time of examination. Her blood pressure was 150/90 mm Hg (>99 th centile). Systemic examination was unremarkable. The prominent finding on cardiovascular examination was a grade 3/6 ejection systolic murmur at the right upper sternal border conducted to the carotids. Chest radiograph showed a cardiothoracic ratio of 0.55. Two-dimensional echocardiogram [Figure 1] showed diffusely thickened aortic valve leaflets, no discrete vegetation, and mild aortic regurgitation. There was a Doppler peak gradient of 70 mm Hg across the aortic valve. Mitral valve was normal. There was no pathology involving the subvalvar apparatus or papillary muscles. There was no evidence of pericardial involvement. Laboratory investigations showed hemoglobin of 9.2 g/dl, total leucocyte count of 8.31 × 10 3 /ul, and platelet count of 155 × 10 9 /l. The blood picture showed normocytic normochromic anemia. The erythrocyte sedimentation rate (ESR) was 89 mm/h and C-reactive protein was <5 mg/dl. Blood urea was 34 mg/dl and creatinine 0.7 mg/dl. Routine urine analysis revealed urine albumin+++, with granular casts. Her antinuclear antibody (ANA) was strongly positive with cytoplasmic fiber pattern; though antidouble stranded DNA (anti-dsDNA) was negative (1:10 dilution). Classical and protoplasmic staining antineutrophil cytoplasmic antibodies (cANCA and pANCA) were negative. Complement C 3 levels were normal (1.13 g/l; normal range: 0.89-1.87), whereas C4 was low (0.13 g/l; normal range: 0.16-0.38). Blood cultures were negative. Following nephrology consultation a renal biopsy was done. 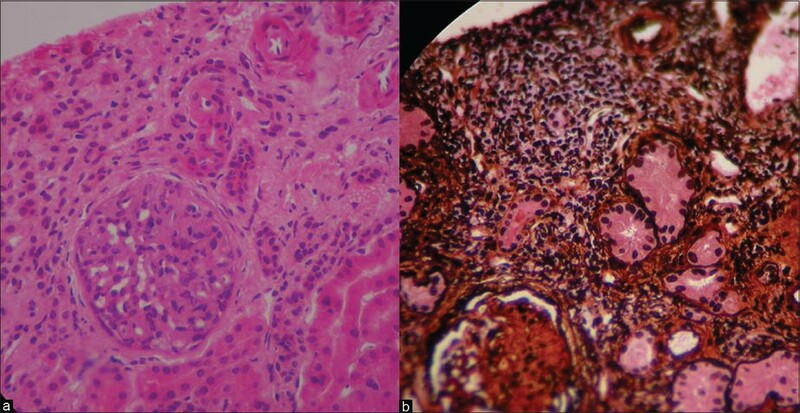 The renal biopsy [Figure 2] showed diffuse proliferative glomerulonephritis with mild tubulo interstitial changes (stage IV lupus nephritis). The interstitium had focal infiltrates of lymphocytes and plasma cells with few neutrophils and foam cell clusters. Amyloid stain was negative. She was started on intravenous methyl prednisolone in pulsed doses for 2 days followed by daily maintenance doses of oral steroids and mycophenolate mofetil (MMF). During the next few weeks she developed steroid-induced diabetes mellitus, with her postprandial blood sugar rising to 368 mg%. The glycosylated hemoglobin (HBA1C) was 7.9%. Following reduction in steroid dose and strict diet/exercise regimen, diabetes was brought under control with postprandial blood sugar of 118 mg/dl. At last follow-up, she was clinically well, though still hypertensive (BP 160/100 mm Hg). The 2D echo showed a decrease in aortic valve thickening and a reduction in the transvalvar doppler peak gradient to 52 mm Hg. SLE is characterized by autoantibodies directed against self-antigens, leading to inflammatory damage of many target organs. Prevalence rates of 4-250/100,000 have been reported, with female predominance, varying from 4:1 before puberty to 8:1 afterward. The diagnosis of SLE is typically based on the revised (1997) criteria of the American College of Rheumatology (ACR). The ACR criteria require a serial or simultaneous presentation of four or more of the listed symptoms for the diagnosis of lupus, namely malar rash, discoid rash, photosensitivity, oral ulcers, arthritis, serositis, renal disorder, neurologic disorder, hematologic disorder, immunologic disorder, and antinuclear antibody. Though the present case did not fulfill any of the ACR criteria at presentation, clinical diagnosis of SLE was suggested by the presence of aortic valve vegetation in an otherwise healthy girl with proteinuria and elevated ESR. Interestingly anti-dsDNA was negative in this case. Anti-dsDNA antibodies are highly specific for SLE but they are present only in 70% of cases. Manson et al. found high avidity anti dsDNA antibodies in only 13 out of their 16 patients and recommended antinucleosome antibodies to further increase the diagnostic specificity. Min et al., in a prospective study of 129 patients with SLE, found little or no anti-dsDNA reactivity in 25 cases during the course of their disease. Among these, antinucleosome antibodies were present in 15 patients. Eight patients with anti-dsDNA negative SLE had renal disease and all these cases had antinucleosome antibodies. The present case was not investigated for antinucleosome antibodies. As this patient did not have evidence of thromboembolic disease, anticardiolipin antibody test was also not done. Pathologic changes ranging from focal areas of mild acute inflammation to severe postinflammatory fibrosis may be noted in all layers of the heart as well as coronary and pulmonary arteries. The classical valvular abnormality is the verrucous Libman-Sacks lesion, originally described in 1924. Valvular abnormalities have been documented in up to 35% of patients with lupus. This percentage rises to 48% among lupus patients with antiphospholipid antibodies. Libman-Sacks endocarditis most commonly involves mitral and aortic valves even though all four valves can be involved. Valvular abnormalities occur as masses, diffuse leaflet thickening, valvular regurgitation, and, infrequently, stenosis. The lesions are characteristically located on the ventricular side of the valve and along the chordae tendinae, papillary muscles, and occasionally the mural endocardium. Microscopically, these pea-sized lesions consist of proliferating and degenerating valve tissue with associated clumps of fibrin and platelet thrombi. Necrotizing valvulitis, organized thrombus, or end-stage fibrosis may occur less commonly. Distinguishing vegetations of infective endocarditis from those of Libman-Sacks endocarditis may be difficult. Broad-based vegetations (without independent mobility) located on the free margin of the atrial side of mitral valve and ventricular or vascular side of aortic valve are suggestive of Libman-Sacks lesions. The lesions may be single or multiple, lack tissue destruction, and are usually heterogeneous. Leaflet thickening, characteristic of Libman-sacks endocarditis, is not commonly seen in infective endocarditis. Moyssakis et al. studied the natural history of Libman-Sacks endocarditis in a group of 342 adult patients with SLE followed up for a period of 4 years. Thirty-eight patients (11%) had Libman-Sacks endocarditis at presentation. Twenty-four patients had mitral valve involvement, whereas 13 had aortic valve disease. Mitral regurgitation worsened in five patients on follow-up. Stenotic lesions worsened significantly and eight patients developed new lesions. In a series of 49 children with SLE, Fish et al. found cardiac involvement in 15 (31%); and this was serious in 5 (10%). This case illustrates the significance of isolated clinical and laboratory findings in leading to a correct diagnosis when there is a paucity of clinical clues. 1. Hochberg MC. Updating the American College of Rheumatology revised criteria for the classification of systemic lupus erythematosus. Arthritis Rheum 1997;40:1725. 2. Silverman ED. Pediatric systemic lupus erythematosus. In: Rudolph AM, Rudolph CD, Hostetter MK, Lister G, First L, Gershan A. editors. Rudolph's Pediatrics. 21 st ed. New York: McGraw-Hill; 2003. p. 848-51. 3. Manson JJ, Ma A, Rogers P, Mason LJ, Berden JH, van der Vlag J, et al. Relationship between anti-dsDNA, anti-nucleosome and anti-alpha-actinin antibodies and markers of renal disease in patients with lupus nephritis: A prospective longitudinal study. Arthritis Res Ther 2009;11: R154. 4. Min DJ, Kim SJ, Park SH, Seo YI, Kang HJ, Kim WU, et al. Anti-nucleosome antibody: Significance in lupus patients lacking antidouble-stranded DNA antibody. Clin Exp Rheumatol 2002;20:13-8. 5. Nesher G, Ilany J, Rosenmann D, Abraham AS. Valvular dysfunction in antiphospholipid syndrome: Prevalence, clinical features, and treatment. Semin Arthritis Rheum 1997;27:27-35. 6. Silbiger JJ. The Cardiac Manifestations of Antiphospholipid Syndrome and their Echocardiographic Recognition. J Am Soc Echocardiogr 2009;22:1100-8. 7. Moyssakis I, Tektonidou MG, Vasilliou VA, Samarkos M, Votteas V, Moutsopoulos HM. Libman-Sacks endocarditis in systemic lupus erythematosus: Prevalence, associations, and evolution. Am J Med 2007;120:636-42. 8. Fish AJ, Blau EB, Westberg NG, Burke BA, Vernier RL, Michael AF. Systemic lupus erythematosus within the first two decades of life. Am J Med 1977;62:99-117.